In any satcom system, there are some fundamental building blocks. This diagram shows these blocks in a basic form to help you understand what they are. Where ever the data to be transmitted via satellite is coming from is the supplier base. this could be anything from an outside broadcast unit to a studio or office complex. Even banks or communications headquarters. In order to get this data to the teleport (satellite uplink station) for onward transmission via satellite, we use a point to point terrestrial data link sometimes known as a bearer because is 'bears' the data or carries it. One of the most commonly used data link suppliers in the UK is BT but they are not the only supplier of such communications links. Many forms of bearer exist and are mainly fibre optic high speed lines or lower speed kilostreams and even permanent leased line (telephone line) connections. Bearers can be occassional use types such as 64k or 128k ISDN lines. Even the internet can be used for some applications. The end aim is to deliver error free reliable data to the teleport. Once the data arrives at the teleport (satellite uplink station) then it is passed to a satellite modem or multiplexed with several other data streams before reaching the modem. 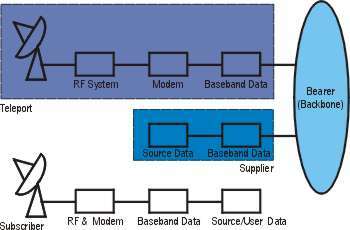 The modems then give an intermediate frequency output (I.F.) which are adjusted for level and frequency before entering the RF system which contains the up conversion, filters and high power amplifiers. The signal containing the suppliers data is then broadcast to the satellite through one or more antenna at the teleport. More than one antenna is used if the data is required on more than one satellite to increase coverage. Finally the signal is received back on earth at the subscriber terminal. This could be a large VSAT for distribution of many data streams such as the internet or a small terminal such as a Satellite TV system or video conferencing system. This whole system can be two way or one way depending on the requirements. Broadcasting is usually one way and point to point transmission is usually two way. There are also Multicasting applications where the broadcast is sent to everyone but only those who are interested or requested the data can receive it. These principles are the same for all satellite systems however big or small. A Star Network comprises of a Hub satellite station which transmits to and receives from multiple remote subscriber sites. This kind of network can be used in one direction only such as from the Hub to the subscriber and this is how the Direct-To-Home (DTH) satellite TV systems are run. 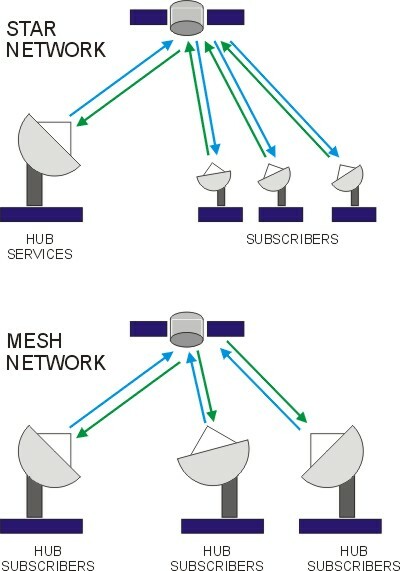 A Mesh Network consists of multiple Hub or mini-Hub satellite stations all transmitting and receiving between each other. This kind of network is often used between large organisations such as banks and other large corporate enterprises. This method is ideal for connecting large computer networks at each Hub together. Variations on these two core network topologies are used every day to connect up the world of internet, telephone, television, banking and countless other media and information systems. Now we can revisit the Modulation schemes touched upon earlier and see how they work.